I AM BUSY WORKING ON A BUNCH OF NEW COLLECTIONS AND I CANNOT WAIT TO SHARE THEM. IF YOU WANT ME TO TEST ONE OF YOUR PHOTOS WITH MY NEW PRESETS PLEASE SEND ME AN EMAIL. BOTH RAW AND JPEG UNEDITED PHOTOS ARE WELCOME. IM WORKING HARD ON DEVELOPING BOTH DESKTOP AND MOBILE COLLECTIONS. AND BECAUSE I CAN’T HELP SHARE MY EXCITEMENT WITH YOU, HERE’S A SNEAK PEAK OF SOME OF THE NEW PRESETS APPLIED TO MY RECENT PHOTOS. The presets are amazing and when I had trouble figuring out how to make one work for me Lisa took the time to answer all my questions and send me videos explaining what I could be doing differently!! SO helpful!!!!! I’m so glad I was able to help you!! Great idea. I’m going to get on some youtube tutorials soon! Hi Lisa, I love your pics on instagram! Which presets did you use for you trip to Thailand? Hey Pamela, Thank you for loving the pics, for Thailand I used a mix of everything (both Bali and Travel Essentials presets) because the landscape can vary so much! Yay Abby!!!! That’s so awesome to hear! Thank you! Which pack do you have? So these presets are designed for the computer but there is a sneaky way to get them on your phone! YouTube Matt Larson, he’s got a great video on it! I’ve been following you since I joined Instagram and love your feed – it’s full of inspiration. I just purchased your presets and can’t wait to try them out! Thank you so much girl! I’m so excited to see what you create with them! Thank you so much babe!! Can’t wait to see what you create! Do you have Russian version ? Hey unfortunately I don’t have a Russian version. Hi Lisa! So I installed your presets but keep on noticing that my skin looks very orange! Do you usually tweak your presets are can they be used without tweaking? Thanks! Hey Daniela, no my all means tweak them! Everyone’s skin tone is different and I know that not everyone has olive skin like me. I wanted to give you guys an edit that I actually use and that is as close to my photos as possible which is why I left the oranges as dark as they are. But you can totally play with the luminance and saturation if it doesn’t work for you. First of all, I never comment on blogs, but I wanted to say how much I love your presets, your IG live that you just did was super helpful, and I must say that your prices are SUPER fair! Omg thank you so much love!! It’s always so great to hear!! Does travel essential collection works on iPhone 7+?? Yes the presets work with any RAW or JPEG image. For optimal results its best to be shooting in RAW and editing on a desktop but there is a way to download the presets on your mobile my following Matt Larson’s youtube video – check him out! LISA I CAN’T CHOOSE WHICH ONE TO GET… WILL YOU HELP ME? Im into travel, everyday/lifestyle, city, landscapes. ANd I also like vibrant, colorful tones. In that case maybe the Travel Essentials will be best, it has a little of everything in it. OMG this message is so wonderdul! I love hearing that you love them so much, thank you! Hey girl, Thank you so much for loving my work and these presets! A lot of time and effort has gone into them. Unfortunately without a credit card I cannot sell them. CAN you tell me which camera do you use ? So sorry for the delay. I use a Nikon D750 to shoot with. Which app you are using for editing pictures? Hey I am using the app Adobe Lightroom which is the software you can use my presets on. Hello Lisa, I am thinking of buying your amazing presets. I don’t know which ones to pick and truth be told, I’m not a good photographer. Should there be certain elements present in my original photos that would do well when combined with your presets? No these presets can be used on any photo whether it’s a camera or phone. I do however suggest that the photos are shot daytime. Once the sun goes down and the images are too dark it will be very hard to edit. These are amazing! However, I don’t travel much and I want a preset I can use for on a daily. Which one would you recommend? I would probably suggest travel essentials in that case. It has a good mix of box beachy and city. i just bought your presets because i love the way you blog. I am starting with my travel blog so i want it to have your presets. The thing is when i try to open them it says “Search the App Store for an application with which you can open this document or select an application installed on your computer” can you help me? hi Lisa, I cannot access to the payment link on this page . Can you help me ? Hey Bianca, Thanks for letting me know. I looked into it and it has now been fixed, you can go ahead and purchase! Hi Lisa! I am trying to purchase but I am only seeing comments and Instagram photos. Where may I go to buy these presets? Thank you! Hey Chloe, Thanks for letting me know. I looked into it and it has now been fixed, you can go ahead and purchase! Hi Lisa! Want to get your presets but they aren’t showing up here to purchase…it only shows the comments. Help! Hey thank you so much for letting me know. It’s now been fixed! Hey Lisa, I have been following you for a few months now and I really like your presets! I was looking into getting your Travel Essentials Collection but, I was wondering which collection you think is more universal? I am going to Scotland, Costa Rica, and Colorado this year and I was wondering which preset would work best for all 3 locations. Thanks! Thank you so much for loving my work. I would suggest Greece or Travel Essentials. I used Greece a lot after my trip and in November started developing new ones reflecting more of this new style I’ve been vibing lately. I’m currently working on new presets that are more reflective of my current trips and I hope to be releasing those in the next coming months. Hi, Lisa! I’m wanting to purchase your presets, but I’m curious…have you release these new presets you’re referring to? No not yet. I’m working on perfecting them and they will be out soon! Hi lisa can I use your presets in mobile phone ? Your posts inspire me so much and feed my desire to travel! I want to start traveling as well, and I do plan to purchase your presets. Do you mind sharing with me what camera and lens you use? Thank you! Love your presets! i’m going to italy in a few months and i was wondering what preset packet you recommend! i really like the Bali one. Hey Lisa! I love your presets and recently purchased the Travel Essentials! But I feel like I look too orange on all my pics! Is there a specific thing the presets have that makes this happen? Thanks a lot! Hey! So the presets are designed for me and my skintone which is darker than most. you just need to adjust the luminance and the saturation and you should be good! Hi! Loved your Bali presets– I just emailed you concerning them (I don’t know if I downloaded them correctly). I’d love to hear back from you, Thank you. I think I spoke to you this morning.. Any more question I can help with? We are using a D7000 nikon camera and am wondering what lens we should get to get wonderful pictures like you take! What would you recommend? And I’ve always wondered if its important to have wifi in cameras! Probably makes it much easier to take photos off of camera and use it. Hey when is your trip? I’ll be releasing new ones soon! HI Lisa will you be coming out with mobile ones soon?!!?!? Hey Lisa!! I was wondering when will you release the new presets ? Can’t wait !! Thank you so much for the motivation!!! I’m working on them! Stay tuned for Spring 2019! Hi Lisa, I really want to buy your presets. 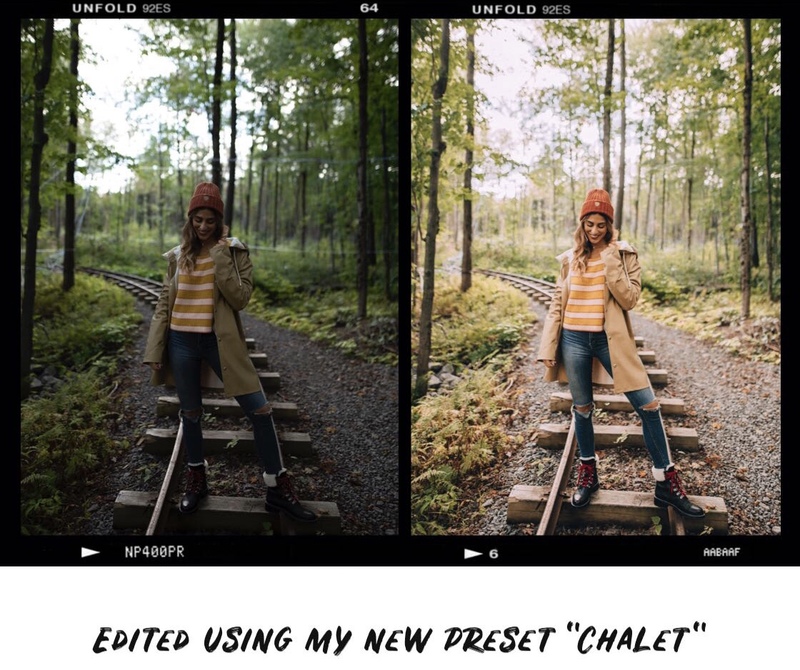 I just started a fashionblog: @yasminaqamar on Instagram and I would love to use your presets. Unfortunately I don’t understand how I can purchase them? Please help a girl in need out!!! !